In honor of the Love Your Smile event I co-hosted yesterday, I thought I’d share some of Dr. Davidowitz’s perfect-smile tips as well as a few of my own nutritional tidbits relating to oral health. Here’s a handful of questions I asked, of course, his professional answers! 1. Where does bad breath come from? Bad breath comes from bacteria and sometimes from disease or illness. Morning breath results from the lack of oxygen present in the mouth overnight – bacteria grows when there’s a low O2 level or in a dry mouth. 2. What’s the best way to get rid of bad breath? Brush, rinse and floss regularly. Flossing before bed is most important so that food isn’t sticking to your teeth all night long and causing a “bacteria party.” Also, brushing or scraping your tongue is a great way to significantly decrease bad breath. 3. Are some people prone to cavities or are they a result of poor oral care? Unfortunately, cavities are very much genetic. For people who know they’re prone to them, they can make dietary and oral care changes to be sure they have a fighting chance against tooth decay. 4. Speaking of dietary changes, are there foods you recommend avoiding? Yes! Sticky and soft carbohydrates tend to stick to your teeth. The chemical breakdown of carbs that happens in your mouth results in acid formation and that’s what eventually leads to tooth decay. 5. Is it possible to floss too much? No, so long as you’re gentle each time. Ideally, flossing after every meal would keep your mouth at its best. 6. What’s the best order for cleaning? Anything works so long as you’re doing it, but the absolute best order is: rinse, brush, floss and rinse again. This ensures you get as many food particles as possible and finish up with a freshening rinse. As for the nutrition part, avoiding sugary foods is #1. Anything sticky will live up to its name and stick to your teeth. And there you have it… Proof that a beautiful smile starts with what you eat! Thanks so much to Dr. Davidowitz for a super-fun event and lots of great oral health tips! PS if you follow Luxury Dentistry on Romio, you’re automatically entered to win a FREE Opalescence Teeth Whitening System worth $125!! Now that you’ve trashed all the crap in your pantry and fridge after yesterday’s pantry reno post, it’s time to restock with foods that will fuel your body and help you reach your goals. Since not everyone has the same nutritional needs or goals, I’ve created three lists for you to choose from. 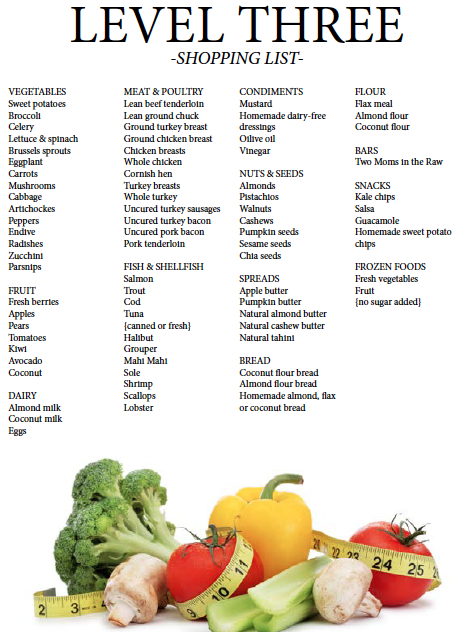 Whatever diet you follow or goal you have in mind, restock to suit your needs based on the general food groups and tips provided in each list. Start here if you’re serious about making changes in your diet and wouldn’t mind shedding a few unwanted pounds. This is a beginner’s guide swapping crap for quality. Start here if you have a target weight loss goal and a deadline at least six months away. Eating the foods on this list will promote a gradual weight loss so long as your calories are in check. Click HERE to calculate exactly how many calories you need to lose weight. Notice in level two we’re starting to cut back on dairy, which isn’t tolerated by the majority of the population and can cause gas and bloating. We’re also starting to avoid commercially processed foods like cold cereals and choosing really dense, whole grain breads instead of lower fiber ones. Start here if you need to lose weight fast. This is not a crash diet, just a quick reset to get your fat burning engine going and cleanse your body of any excess garbage. No processed, man-made foods allowed, no grains, no dairy and no legumes. If you need to de-bloat for an event, this list will do the trick. Don’t forget to calculate your daily calorie target for fat burning! Now that you know what each level entails, let’s get to it! 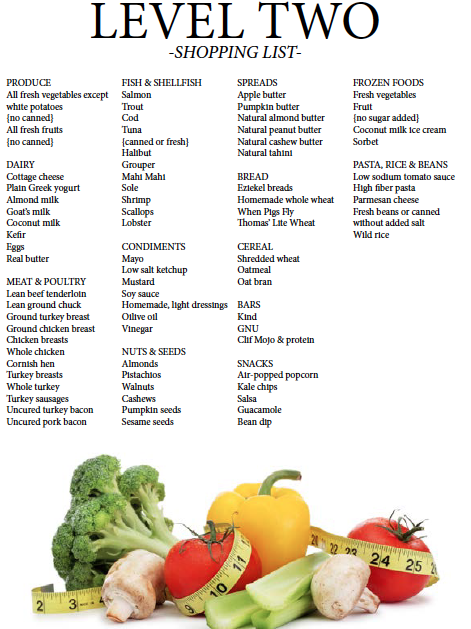 Click on each image for a PDF shopping list you can save and take with you to the supermarket.